Some of our bachelor friends and even a few reader have asked me to post some quick vegetarian recipes that they can cook without hours laboring in the kitchen, especially after a hard days work. I have been planning to cook and post a few of my go to recipes but the bad health of the whole family kept me away from the kitchen. I will definitely post some good side dishes later that one can enjoy with rice or roti, but today am posting a very easy one-dish rice recipe that can be cooked in a jiffy. Yes, you can prepare a full meal with this under 30 minutes. It’s that easy and suits those moments when you crave a good home cooked meal without any effort. For weekend dinners I like to prepare one-pot meals be it soup, Pasta or rice dishes. These preparations are perfect to have from a bowl while watching your favourite program or movie. I first started cooking these when I was in Delhi. Our hostel often served Tahri or the peasant rice dish from UP. For variations they added various veggies and sometimes soy nuggets. That was my easy soothing meal after a hard days work. 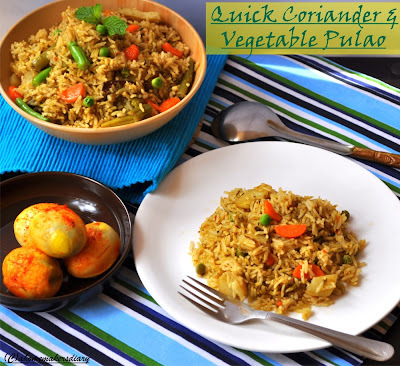 Then when my brother came to Delhi for his Industrial Training I started experimenting more with such dishes and one day cooked this coriander pulao with lots of vegetables. That was an instant hit and thereafter became a staple in my kitchen. Then recently I saw sandeepa cooking her egg pulao with almost this same spice blend but then she added a few mint leaves. I was intrigued by that idea and this time has also added a handful of mint leaves from my garden. It gives a very mild minty kick to the dish, which we loved. And now hubby calls this green chutney pulao. This dish needs a raita at the sides to cut the spice and to make a perfect meal. You can cook this dish in a big pan or even in microwave but I prefer my pressure cooker. As the minimum stirring keeps the rice grains whole and separate. Now cooking perfect pulao in pressure cooker is a bit tricky. The ratio of rice to water has to be perfect and also the number of whistles you should allow. This time I am giving you exact measurement and in the pictures you can see the results yourselves. Here is the step-by-step recipe. First prepare the rice. Wash it properly, drain the excess water and then spread on absorbing paper. Let it completely dry before use. Heat 1 tsp oil in a pressure cooker. Add the vegetables and salt, fry on low for 3-4 minutes. Add the rest of the oil and temper with clove, cinnamon and pepper. Once they start to splutter add the spice paste. Add salt and fry on low till oil separates at the sides (approx 6-7 minutes). Add the rice and fry for a minute. Pour the warm water and lemon juice. Add the vegetables. Give a stir to mix everything. Check the salt. Cover and let it cook till one whistle on low flame. Once done switch off the gas and let the steam escape in itself. Uncover and fluff the pulao with fork and serve hot with Raita. Both of us were having cold so this time we had ours with garlic-mango pickle and hard boiled eggs fried with salt and turmeric (thanks for the idea Bongmom). If you are not having cold then don’t give a miss to the raita. That makes the meal perfect. Sandeepa has a similar egg pulao here. Sending this to Akheela's Festive rice event at Torview. 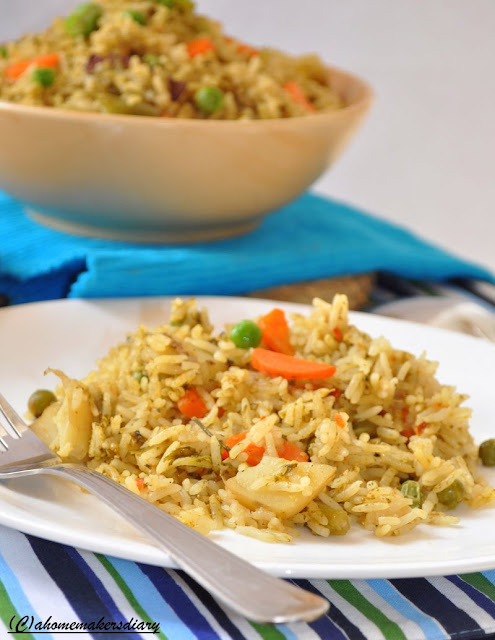 Pulao, pulav, polao, rice pilaf, quick pulao, green pulao, green chutney pulao, rice dish, indian rice preparation, coriander pulao, mint pilaf, vegetable polao, sabzi polao, Subz pulao, cauliflower, pulao and raita, one dish meal, one pot meal, easy meal, quick meal, meal in hurry, meal in jiffy, quick one dish rice, rice for dinner, Indian rice meal, vegetable meal, spicy rice dish, spicy rice pulao, pressure cooker pulao, pressure cooker rice, how to cook pulao in pressure cooker, perfect pressure cooked rice, perfecr pressure cooked rice pulao, very easy polao, savory rice. coriander rice, vegetable rice, rice in pressure cooker, how to cook rice in pressure cooker. 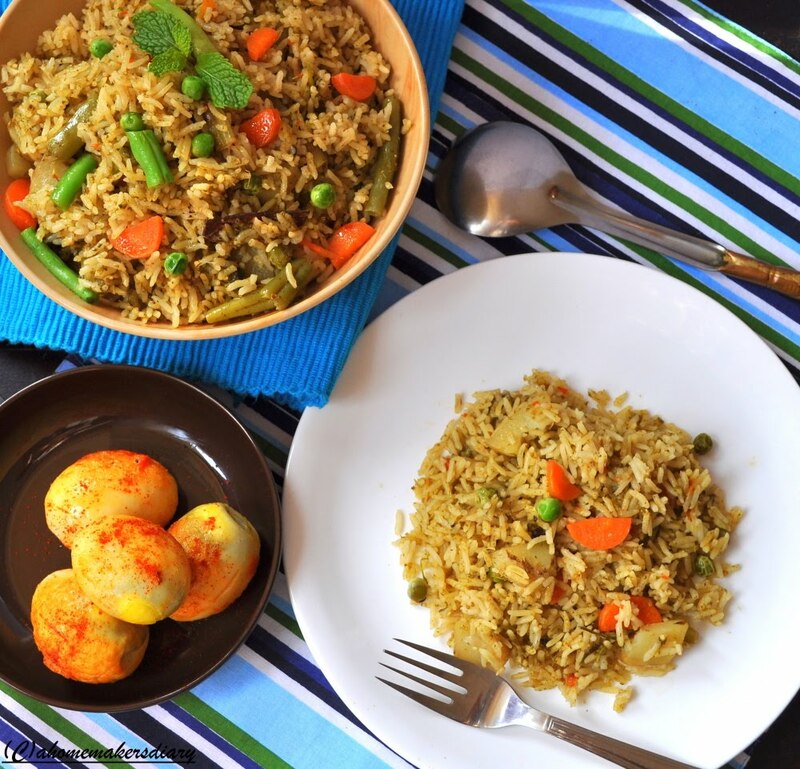 I love one pot meal too and this is one more incredible dish from you..comforting,easy, filling n delicious.. can imagine the wonderful coriander flavor in the pulao..lovely presentation n clicks dear! 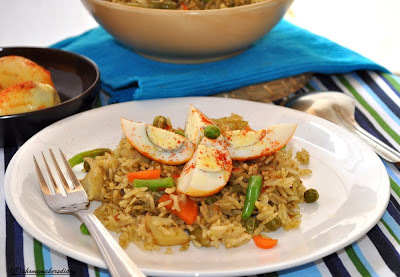 very yummy looking pulao..loved the last pic with eggs! Fantastic looking pulao, very tempting! I love one pot cooking and this rice looks perfect. one pot meal always is convenient on lazy days.. liked the combo with fried eggs..eager to try it..
this looks so yummy and colorful too !! Love this kind of one pot meal and that looks so comforting and delicious..great presentation..love those egg slices on top...so yummie! A delicious one-pot meal. Beautiful clicks. Wow this pulao looks so colorful and delicious..great explanation indeed. looks wonderful. I love such 1 pot dishes! You bet one pot meals are life savers on a busy day! I haven't tried a pulav with a predominant coriander flavor, this sounds good and looks really inviting with the fried eggs for company..
Quick & easy and i love the flavour of coriander too...looks very delicious.. Healthy eating promotes longevity. I always ask my friends and family for healthy recipes that ensure adequate nutrition. I usually avoid eating junk food items.I love this all recipes. Yes as all said i too lve onepot meal.ur vesrion of this biryani, sounds very yummy and i love to try various version of this dish too. Pulav looks delicious, good clicks. Vegetable pulav ta durdanto hoyechhe. Dekhei to khete ichhe korchhe. Darun recipe. Chhobi gulo khub gorgeous lagchhe. Your vegetable pulao is mouth watering. One pot meals are great now that school is in session. The evenings get so busy with all the afte school activities. Great presentation, love your idea for easy cooking but I bet it tasted delicious..
Btw how is your son now? Medicine-r dose shesh hoyeche? O wow, your pulao looks and sounds amazing. So good I'm bookmarking it. I can have this yummy pulao right now...looks so delicious! LOve the flavors..looks so delicious..
Hi Sayantani! Thank you for visiting my blog and for your encouraging words, you made my day!! And glad u found the info on my blog useful,look forward to more interaction with you! Simply love this comforting food !! 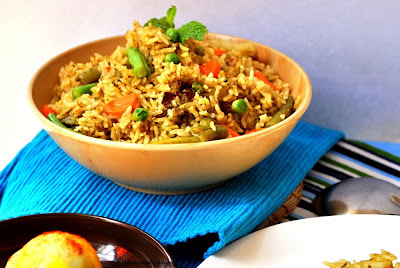 Pulao looks and sounds very nice,I always try different recipes every time,this is sure a must try!